We begin with three children playing catch, the camera following the ball they throw. In any other show, this might be respite, but for Twin Peaks, we’re immediately on edge. There’s something about kids that feels even more vulnerable after the hit and run. Something isn’t right, but it turns out it’s for the better – Miriam is alive, crawling her way to help in bloody desperation. Becky desperately needs to see Stephen, so she rings Shelly to bring her car to the trailer park. Norma stands up after eleven episodes of sitting at the same table to look concerned. Shelly arrives to help her daughter, but Becky has other ideas. She has a gun and a lot of anger for her husband, so she doesn’t mind stealing the car, throwing her mother off the hood when she tries to hang on. Carl arrives to help, and gives Shelly a lift back into town, ringing Bobby on the way. The FBI and co. arrive at the site that Bill Hastings said he met the Major, in an abandoned complex of dilapidated buildings. They spot another woodsman spirit in the distance, and Gordon heads in to investigate. As he approaches the site, Gordon encounters a vortex appear in the sky, through which he sees a room full of woodsmen. Gordon attempts to interact, but is pulled back by Albert when it gets too dangerous. At the Double R diner, Bobby and Shelly have brought Becky back, and are trying to help her out of her abusive relationship. Despite her spiteful words for him, Becky still believes Stephen can change. The brief family reunion is interrupted when Red, the man we last saw intimidating Richard Horne with a magic trick, whisks Shelly away for a kiss and girlish giggles. Suddenly a bullet hits the diner, and Bobby heads out of to find out what’s going on. It turns out a man had left his gun in the back of his car and his son had gotten to it. The car behind is honking her horn incessantly, and is desperate to get home. Bobby tries to calm her down to no avail. In the passenger seat, a young child rises like a zombie, with a vile liquid spilling from its mouth. Back in Buckhorn, Gordon is recovering from his absurd sighting. Albert reveals a photo of Ruth’s arm, with the co-ordinates written on them. The last few digits are smudged, and Diane makes an obvious attempt to memorise the number. Diane reveals that she saw the same man that Gordon and Albert had seen, but not that she saw it approach the car. In a meeting with Dougie, Bushnell reveals that Dougie’s work has uncovered organised crime and its links to their office, which he believes is connected to the attempts on his life. He also knows that the Mitchum brothers are eligible for their $30 million claim, so sets up for Dougie to meet with them to deliver the cheque. Meanwhile, the Mitchums are getting waiting in anticipation of the meeting with the intention of it ending violently. In fact, Bradley wants to kill Dougie so much he can’t bear to eat his cereal. Dougie sees a vision of Gerard in a shop window, and is guided to make a purchase. He returns with a package, which he takes with him in the car to meet the Mitchums out in the desert. Bradley is conflicted however. In his dream the previous night, he had seen Dougie with a similar package. He believes that if the item he is carrying is a cherry pie, the same as the one from his dream, he is not their enemy. After a sequence that plays out like a much lighter version of David Fincher’s Seven, they find the cherry pie in the box, and after frisking him they find the $30 million cheque too. I’m not really sure what’s happening with Diane. Her terrified encounter with Mr. C seemed genuine, yet we know they are in contact secretly. In this episode she withholds information, attempts to steal a look at the co-ordinates (which I am sure Albert altered for her to get the wrong information), all without seeming like any sort of villain. Weirdest of all is her lack of surprise at seeing the woodsman spirit, and her apparent knowledge of their power (“There’s no back-up for this”). Also, it was a mighty shame to see Hastings go, as I was really enjoying Matthew Lillard’s performance. At least death often isn’t the end for characters in this show, maybe he will turn up in the black lodge. That entire encounter at “the site” was a brilliant microcosm of this show’s relation with the supernatural. It’s intriguing but dangerous, and Gordon’s curiosity is almost enough to see him blinked out of existence. The three different perspectives of this scene make for a great laugh and a real sense of the world. We see Gordon’s intense confrontation with a portal to a different plane, while Albert sees him behind a blurry wall, almost fading away. Zooming out to what Diane and Mackley see, and the scene is absurd – nothing more than a man silently waving his arms in the air. It’s funny, but it also goes some way to show how the supernatural operates in this universe. A theme that has been running through the show, particularly in this episode, is the divisions and connections between different generations. Becky is living out the domestic horror of her mother’s abusive relationship with Leo, who she also drew a gun on at her breaking point. When Shelly gets the call, we see Norma’s reaction – a woman who also married a nasty piece of work. As she turns and looks down, we swiftly cut to Becky looking down in the same way. It is happening again. But this isn’t just the younger imitating the older, as we see Shelly repeating her own actions. She is still in love with the bad boy; this time it’s Red – who we know is a dangerous man. Bobby has matured into a responsible adult, yet Shelly calls Norma to ask her what she should do, almost like a lost child herself. Bobby has some great moments in this episode, with credit due to Dana Ashbrook’s consistently great performance. As he followed his father’s clues, we saw him revert with glee to the optimism of his childhood. Now, we see him dealing selflessly with a hectic situation. It is clear he loves both his daughter and his ex-wife, and is making measured attempts to not push too hard in his quest to make things right. Then the gun goes off, and the violent encounter we expect from Twin Peaks’ worst inhabitants turns out to be something much worse, in a way. The idea of a young boy accidentally letting off a man’s gun in the backseat of their car is pointed enough, but the way Bobby focuses on the child and his father, almost overwhelmed by the clear imitation is wonderful. While it was an “accident,” it is clear why this has happened. When he sees the zombie-like child appear in the car behind, it’s as if his fear for the younger generation has been physically manifested. He looks on with confusion at something that looks both dangerous and in pain, unable to help. Not a huge amount has changed for Cooper, but we are inching closer to his return. The taste of the cherry pie and the sound of the music are Proustian moments, as Cooper comes overwhelmingly close to his memories through the sensations. When he hears and repeats “Damn good,” it is a Cooper inflection, a moment of clarity we haven’t seen yet. There can’t be much further to go. It’s strange to think that when Bradley Mitchum was first introduced he was the terrifying presence that told someone to leave town after beating him to a pulp. Now he might be the most likable man in Las Vegas, and it all comes down to the excellent comedic performance Belushi is giving. The way his knees bend slightly as he sees the cheque, the way he glumly dismisses his cereal … it’s all down to some great character work and precise comic timing. Throughout Fire Walk With Me and this revival series, electricity has seemed to be important to the meeting between worlds. Hawk points out that the fire on the map could represent electricity, but it’s not necessarily good – it “depends on the intention, the intention behind the fire.” So presumably electricity is something but the white and black lodge communicate through. 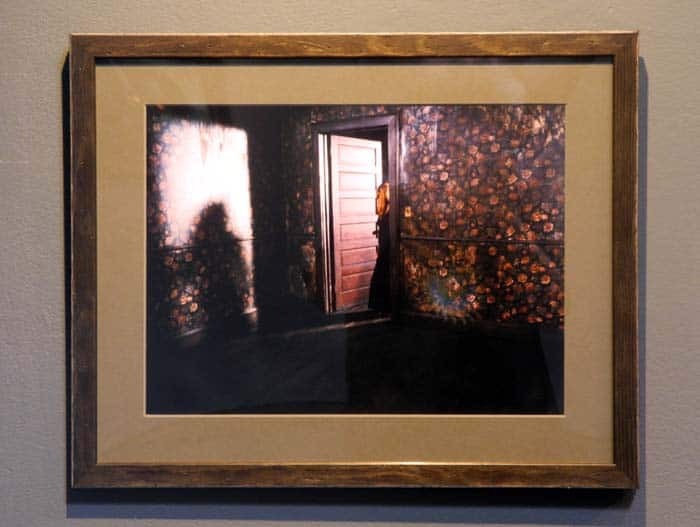 In the quick shot we get of the woodsmen on the stairs, you can just about see in the background the wallpaper is the same as one seen in Fire Walk With Me, in the painting Mrs. Tremonde gives to Laura. Jack likes coffee. Even bad coffee is better than no coffee. The same could be said of movies, unless we're talking about A Good Day To Die Hard. If you say "David Lynch" three times he will appear and talk incessantly about Twin Peaks and Mulholland Drive, whether you like it or not. Fully committed to Sparkle Motion.